welcome to the first day of A blog a day for the whole of may! I really hope you enjoy this series and I hope you check out some of the lovely bloggers I've managed to get involved! Today the lovely Allie is going to be talking to you about some cute storage ideas, Enjoy! Hellooo I'm Allie aka yougottabegorgeousx and I thought I would share with you my cute little storage tips for make up and other bits. So last year I redecorated my room but I never felt completely satisfied with it, it just didn't have those little finishing touches, but over the last few months I have been finishing it off. 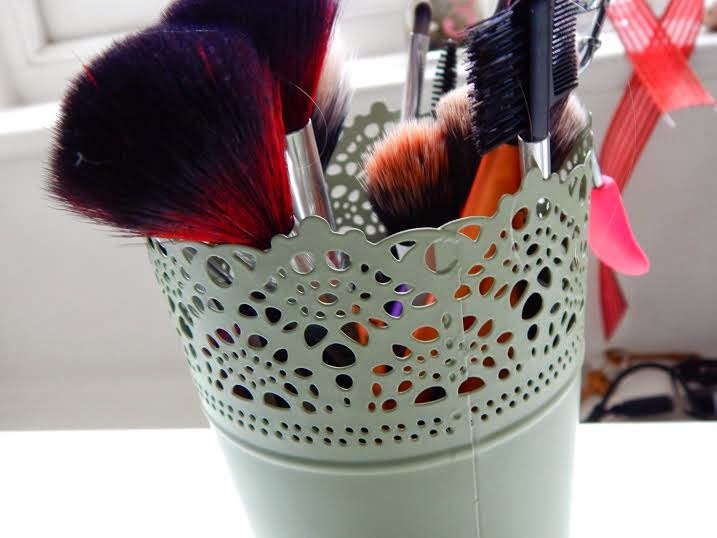 My make up brush storage is something I think is quite "famous" in the blogging world, it's the Skurar Plant Pot from Ikea, I have it in green and I love that it is just a little bit different but still that style. This is great for make up brushes, it is just the right height. There are loads of stuff from the Skurar range that are great for make up lovers. 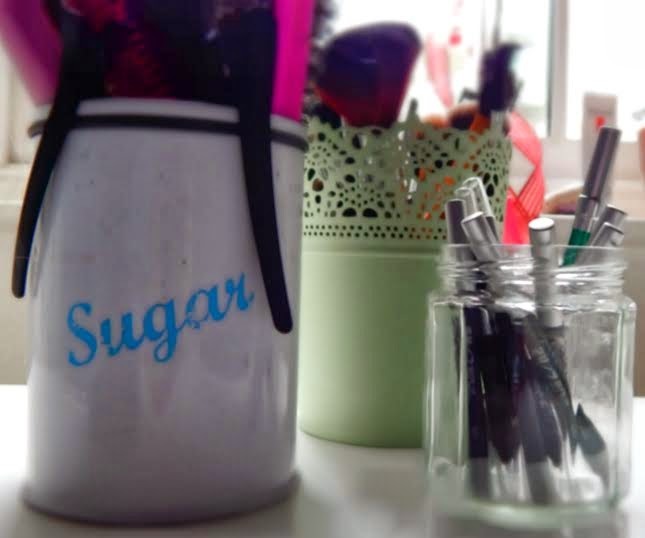 For my hair brushes and other hair bits I have this gorgeous, almost vintage looking, sugar pot. I think this looks gorgeous, I originally had it for my make up brushes but it was too tall so it is great for hair brushes. 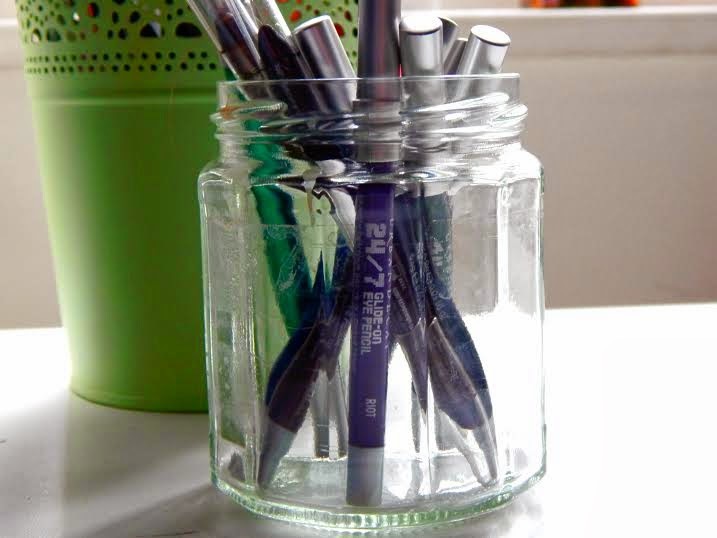 Another little decor item is jam jars, I have started using them for all sorts recently. I used a gorgeous tall one for some daffodils and a shorter one to display my eyeliners, I think they are beautiful and really quirky as they are all different. Just make sure you wash them out properly! Finally I have a gorgeous jewelry hanging stand. I love this and you can get so many different designs. I love mine as it has the stud holes, which are hard to get in jewelry stands. It just means I can display my jewelry in a gorgeous way. I hope you enjoyed my guest post! I just got some cute jars from Dunelm Mill, did the trick perfectly! !